We’re back again with another installment of our GPO Summer Travel Series. And today we’re talking about your trip to discover a natural wonder with layers, colors, rocks and ridges that tell a story like nowhere else on earth. Folks, we’re headed for an adventure at the Grand Canyon in Arizona! Not sure where to begin planning for your great expedition? Check out The Grand Canyon Trip Planner from the GPO Bookstore. Published by the Department of the Interior and the National Park Service, the Trip Planner is a great resource that contains a guide so you can make the most of your trip. In it you’ll find hiking maps and tips. And we’ll even give you a head start now. The rumors are true … high elevation is likely to affect you differently than your home environment. If you and other family members or friends aren’t used to hiking in high elevations, you’ll want to come extra prepared. Drink lots of water, take breaks if you need to, and protect your skin with sunscreen and hats. If you’ve got kiddos coming along in your group, don’t leave home without the Grand Canyon South Rim Junior Activity Book. This fun booklet teaches children about wildlife, geology, land and historic site preservation at the Grand Canyon. Activities in the booklet include recording animal sightings, studying rocks, and decoding the name of each layer of the canyon. And if you return the completed book to Grand Canyon Visitor Center, Verkamp’s Visitor Center, or Tusayan Museum, your child can receive a badge for their good work. We guarantee the adults in the group will a thing or two, too! After all, witnessing something so grand can make us all feel small again. So what are you waiting for? You’ve got the tools. Get out there and experience the magic that is the Grand Canyon. Americans are generally extroverted, friendly, talkative—and apparently, workaholics. As the Europeans put it, Americans live to work, while they work to live. 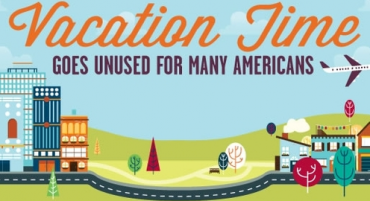 Image source: From infographic on lack of vacation time in U.S. Produced by Column Five for Rasmussen College. Studies by various travel companies and polling groups have shown that Americans are among the group of nationalities that take the least amount of vacation (others being the Japanese, Taiwanese, South Koreans, Singaporeans, and Mexicans). Part of the reason may be that the United States is the only developed nation in the world that does not guarantee any paid holidays for workers by law. The U.S. Bureau of Labor Statistics concluded in a recent report that only seventy-two percent of wage earners in the United States received both holidays and paid vacations voluntarily granted by their employers. The rest of the employed population does not get paid vacation. It’s unfortunate that Americans regularly skip using all their allotted vacation days*. [*See also: Schwartz, Tony (February 10, 2013). “Relax! You’ll Be More Productive” The New York Times.] Surveys of people in the U.S. report that they do not feel their bosses support taking leave, and they fear that being away from work looks like they are not committed to their jobs. Understandably, workers are afraid to look less than absolutely dedicated in this job market. Looking at our lack of vacation days and our failure to take advantage of them, one could conclude that we are not a well-rested people. 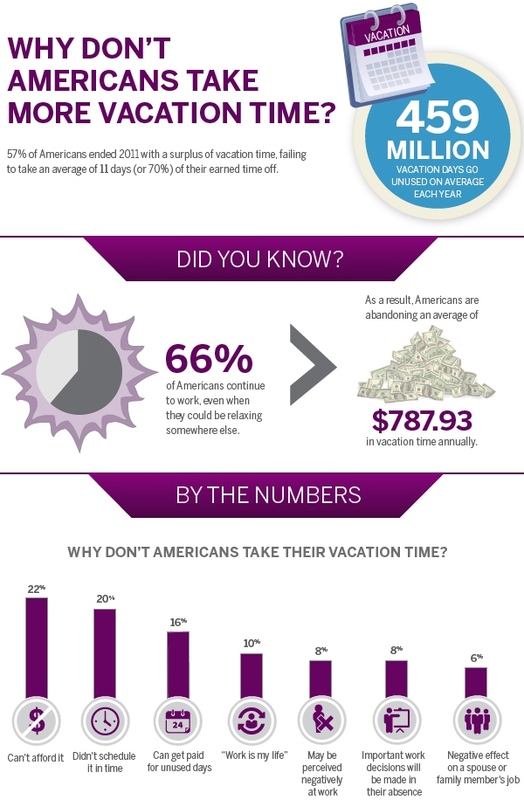 Image: December 2012 infographic on why Americans don’t take more vacation time. Created by: Ally Bank from various public sources. However, health researchers, sleep researchers, and psychologists have found that there is a direct correlation between rest and good health, and rest and productivity. Taking your vacation is almost a tonic against occupational stress. If you do get a paid vacation and have been putting off your annual jaunt, it’s time to sit down and plan one before summer ends. Many Federal Government agencies offer great resources for planning your next vacation or recreational activity. For example, three excellent publications from the National Park Service– National Trails System: Map and Guide, National Park System Map and Guide, and the National Park System (Wall Map Poster) — can aid you in planning your trip to America’s best vacation destinations, our national parks and trails! With the help of these National Park Service maps, you can hike interesting trails and learn history while you are appreciating the outdoors and getting a workout. Or you can pick a national park you’ve never visited before, and experience something new to spur your creativity. If you enjoy visiting cities, pick a park not far outside of town so that you could get a taste of nature in addition to some cultural experiences. For example, the Washington, DC, area where the Government Printing Office is headquartered is a prime tourist and staycation destination with its many national parks and historic sites. Our Washington DC Area Tourism & Recreation collection includes maps, history and guidebooks about the area, including the new 2013 Washington DC tourism map by the National Park Service that includes all the newest monuments and museums. and the wonderful Capital Engineers: The U.S. Army Corps of Engineers and the Development of Washington, D.C. 1790-2004, (reviewed earlier on Government Book Talk blog) that tells “The Untold Story Behind the Engineering of Washington DC” and its many famous landmarks. Once you pick a park, search the Web site recreation.gov to find the activities available there. If you look at the National Park system map and find yourself spoiled for choice, you may be able to narrow down your options when you discover the types of activities available at the parks. And if you are interested in vacationing in a city or a resort, but want to hit a nearby recreation center, you can search for alternatives just by entering a city or zip code. For example, if you plan to visit Las Vegas, but you’d like some time to enjoy rock climbing, too, you might rent a car for the day and drive to Red Rock Canyon National Conservation Area, 12.57 miles from the city center. Most of the National Parks have guidebooks available to help you plan your trip: a number of them are available for sale from the U.S. Government Bookstore. Of course, the money and time needed for a vacation are no joke. You may be one of the unlucky 28% that does not get a paid vacation. Or getting time off work may just be impossible. If any one of those factors applies to you, try a weekend getaway someplace nearby instead. 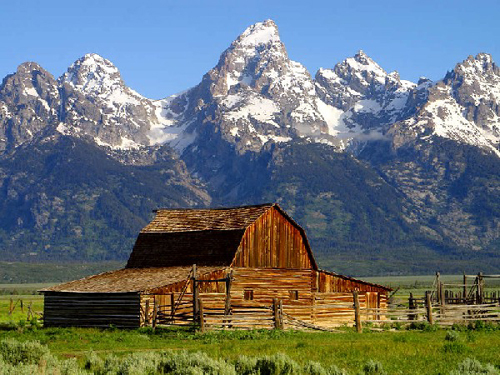 The National Park Service has suggestions for quick breaks or “staycations” all the country. Once you’ve selected a site, you can fine-tune your plans with the information about reservations and camping available at recreation.gov. 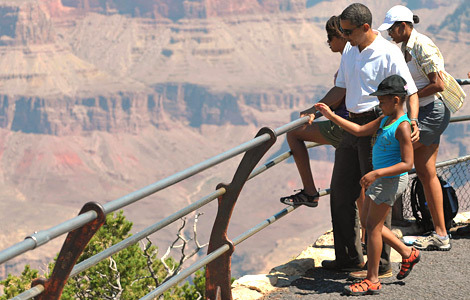 Image: U.S. President Barack Obama and family vacationing at the Grand Canyon National Park in August 2009. Source: White House. How can the public find these tourism and recreation maps and guidebooks? Order by Phone: Call our GPO Customer Contact Center Monday through Friday, 8 am to 5:30 pm Eastern (except US Federal holidays). From US and Canada, call toll-free 1.866.512.1800. DC or International customers call +1.202.512.1800. How can Federal Depository librarians access these publications? Find the records for these titles via the cataloging records in GPO’s Catalog of Government Publication or CGP. About the author(s): Adapted from an original article on the FDLP Community Blog by Jennifer K. Davis from GPO’s Library Services & Content Management Division that supports the Federal Depository Libraries Program (FDLP). Editor and additional content by: Government Book Talk Editor-in-Chief and , GPO Promotions & Ecommerce Manager, Michele Bartram.